The second Sea of Thieves campaign-slash-major update hit Xboxes and PCs last week, and it is, in a word, dull. Cursed Sails isn't too dissimilar from the first campaign, The Hungering Deep, in that the main quest is basically just a case of sailing from island to island to find the next clue. The new equivalent of the boss battle is identical in many ways, too. It's not so much a challenge as it is simply showing up with enough resources to keep your shift afloat, crew alive and cannons firing until you inevitably win. Alongside the humdrum quest, though, are several meaningful updates to the core game. There's positive growth here, and as No Man Sky's NEXT update has shown, continually adding content and making serious changes to a game people were initially disappointed with can eventually pay off. But, five months on, Sea of Thieves still needs more. The background of Cursed Sails is that skeleton ships have started showing up on the Sea of Thieves. The more intimate story is one of Wanda, a weaponsmith who's disappeared from her shop at one of the game's outposts. You head there, talk to a few people, find a clue and then start following the trail she left behind. I made my way to the first checkpoint, but soon after I resorted to sourcing a campaign guide online. Not because the next step was eluding me but because there was no way I was going to spend hours exploring islands in search of dialogue boxes -- I'd been through that process already with The Hungering Deep. I'm glad I rushed through Cursed Sails with a guide open because once you've found Wanda's journals, you're not explicitly told you need to retrace your steps to end up back at the outpost you set off from. What's more, your reward for going on this hours-long journal hunt is a free sail cosmetic -- or three, if you can be bothered to visit the shipwrights at two other outposts. Unless you absolutely have to have the free sails, I wouldn't bother with the main quest because you can cut the crap and head straight to the boss battles. In this way, Cursed Sails is an improvement on The Hungering Deep. The first campaign had you going on the same sort of glorified fetch quest, and though you were technically tracking down items rather than dialogue boxes, it was still just a means to an end. The end being using these items to summon the mighty Megalodon, and then killing it. By decoupling the boss from the quest in Cursed Sails, you can skip the story -- which took me around three hours with a guide to hand -- and go straight to one of the corners of the map to battle the skeleton skips waiting there. In-game days come into play here because skeletons ships only spawn in specific areas at specific times. There's no real difference between the conflicts, though. The skeleton crews just have different names. Like the Megalodon encounter, there's little skill involved in defeating these skeletal foes. As long as you have enough people and resources to keep making holes in their hull and patching the ones in your own, it's just a matter of time: It's a war of attrition. The only difference between the sea monster and skeleton ships is the latter fire cursed cannonballs that make you dance around if they clip you. They waste even more of your time, basically. I never actually finished one of these battles, I must admit. During one encounter, my crew ran out of cannonballs, and when ramming the skeleton ship didn't seem to be doing any significant damage, we had no choice but to abandon the fight. Another time, I was part of a two-ship force that was very close to winning when we both drifted outside of the trigger zone and reset the encounter entirely. I just turned off my Xbox at that point. Put bluntly, the Cursed Sails quest just doesn't interest me. The Hungering Deep added a drawn-out breadcrumb trail and shoot-until-bored boss battle already. Did we really need more of the same? 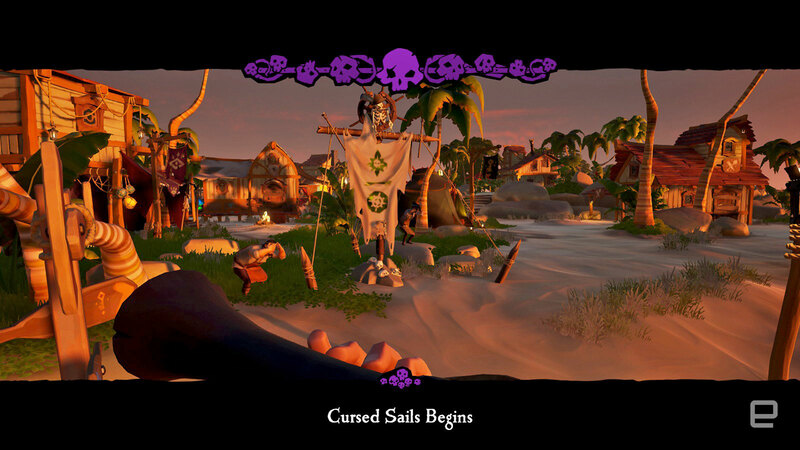 I don't really care for the new skeleton-themed cosmetics either, or the new hairstyles and colors that form part of the Cursed Sails update. If you are into collecting all that stuff, though, shopkeepers have cut the prices of everything for the time being, on account of skeleton-related panic. The new Bilge Rat titles, which are achievements you get for completing elements of the campaign, are pretty repetitive. Some skeletons now spawn with sniper rifles in their hands, and there are new, super-annoying boneheads that run at you with exploding barrels. Get near one of these and it's instant death. These are all pretty insignificant additions to the world of Sea of Thieves, though. It's not really a new enemy type if it's the same enemy wielding a different instrument of death. That's just the illusion of variety. The early days of Sea of Thieves and No Man's Sky have a lot in common. Both promised an incredible open world with loads to do and discover. Both failed to deliver that at launch, leaving consumers feeling that pre-release hype was, to some extent, disingenuous. No Man's Sky studio Hello Games had a whole lot to answer for because the final game was far from what was described or demoed in the years and months building up to launch. The UK's Advertising Standards Authority even got involved to investigate whether Hello Games was misselling its space adventure. 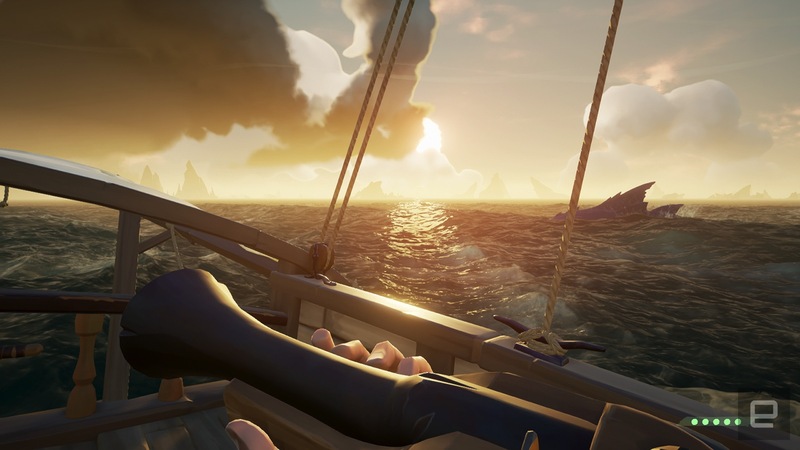 The backlash wasn't as strong for Sea of Thieves, but the general consensus was the final sandbox world would be richer and more dynamic than was shown during the open beta program. It was a first-party title made by Microsoft-owned Rare, and the first high-profile addition to the Xbox Game Pass lineup. But the Sea of Thieves was empty, much like the barren worlds of No Man's Sky. 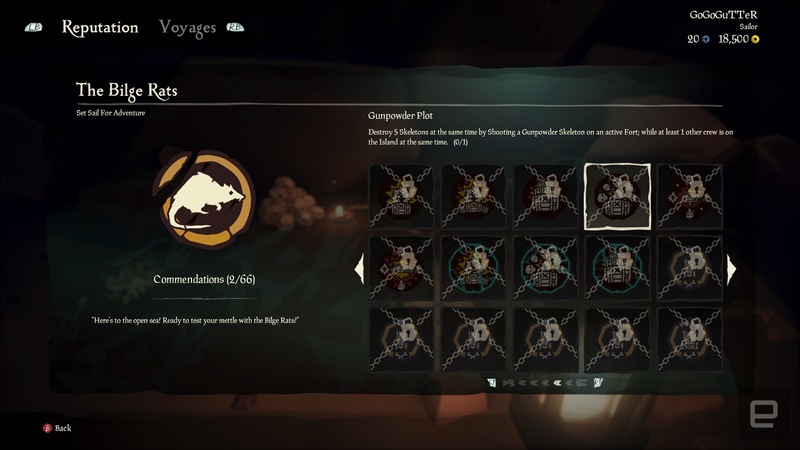 Sea of Thieves has a problem with repetition. 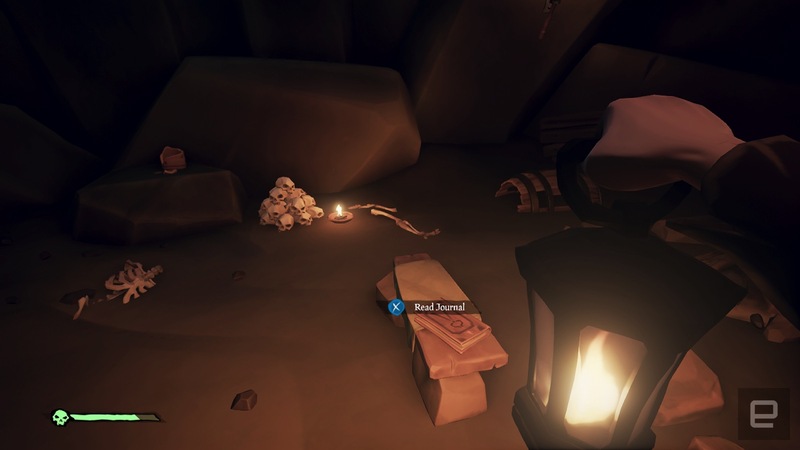 Once you've dug up one treasure chest, killed one skeleton captain and found one rare chicken, you've exhausted the quest types. Then it just becomes Groundhog Day. An unrewarding grind to level up your reputation. The time-sensitive Bilge Rat missions are slightly different, but the reality is you just sail around looking for this game's equivalent of Korok Seeds. At launch, No Man's Sky had a comparable issue with monotony. Resource collecting was both key to progression and to rapid-onset boredom. Many wrote the game off as unfinished, but we've come a long way since then. Hello Games has continued to build out its baby in the subsequent two years, with numerous big updates adding so many features that they change the game entirely. Just a few months after No Man's Sky launched to a deluge of criticism, the first major update added base building, farming and huge interstellar freighters. 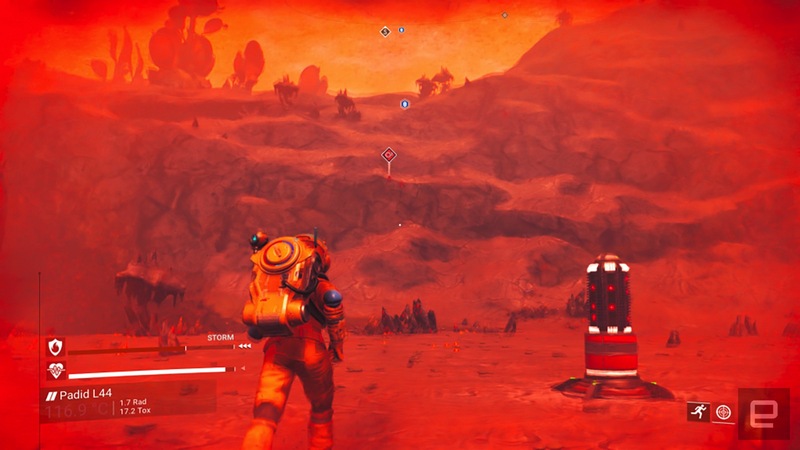 Ground vehicles and terrain editing are just a few of many gameplay elements that have been added since, but the latest update released a matter of weeks ago, No Man's Sky NEXT, seems to have pushed the game beyond some invisible, comeback threshold. The patch is a cauldron of changes, new content and features, but the real magic is proper, real-time multiplayer (albeit still in relatively small party sizes). Reception has been positive. Previous updates were at best characterized as olive branches from Hello Games to the community, and at worst as too little too late. Now, however, there's a general feeling Hello Games has finally come good. The controversy may not be forgotten, but the developers have earned some forgiveness. The game has altered beyond recognition. It's not so much a work in progress anymore. 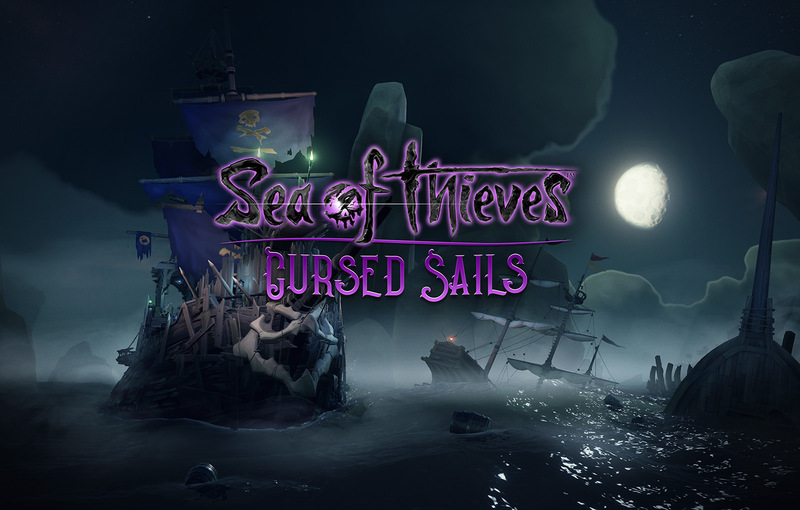 There's a glimmer of Sea of Thieves going vaguely in this direction because there are actually a few meaningful improvements in Cursed Sails that won't disappear when the time-limited campaign ends in a few weeks. The first of these is the new ship type: the brigantine. Where the galleon is best manned by a crew of four and the sloop, a crew of two, the brigantine is most manageable with three swashbucklers on board. I'm impressed with how developer Rare has figured out, yet again, where the sail ropes, captain's wheel, cannons, storage facilities and everything else should be to make crew coordination important without being overbearing. It's not as threatening as the galleon but is more maneuverable; although, the sloop still has it pipped in this regard. Adding the brigantine doesn't just make playing with two others a better experience, but it adds a new silhouette to spot on the horizon. Also, you can now form proper alliances with other ships, meaning you'll get a share of the loot regardless of who turns in the booty at the end of a quest. It's done in a clever, cute way, too. At the top of the mast, in the crow's nest, you can pick a little flag that tells other ships you're interested in teaming up. You can now make camaraderie official, just as you can now formally break an alliance and make it known you're a filthy double-crosser. I consider these type of things are genuinely meaningful because they're don't represent new content, but new gameplay mechanics. Sea of Thieves was supposed to be a game in which you make your own adventures. New mechanics do that. Lengthy fetch quests do not. Leave me alone, I beg you! There was also one moment during my recent bout of playtime that stuck with me. I was sailing from A to B when I heard a strange noise, like something breaching. It's the Megalodon, swimming right beside my tiny sloop. I was legitimately worried, as I was no match for the beast and thought about how much I didn't want to die and have to start this particular journey over again. I decided to do nothing, and off it swam. It was the first I'd heard that the Megalodon was now a persistent part of the game -- a new, consistent threat to progress. Finally, some semblance of variety. That said, Sea of Thieves is on a much slower trajectory than No Man's Sky. In almost five months since the pirate simulator was released, little has changed. The Hungering Deep update added the first, relatively lackluster campaign and a speaking trumpet to communicate with other crews out of immediate earshot. 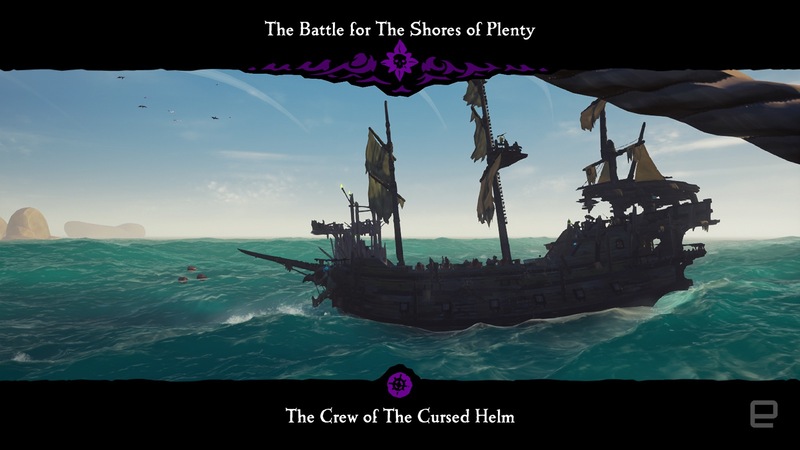 Cursed Sails doesn't really mix up the campaign formula, but the addition of alliances and a new ship type are the first real moves Rare has made to bulk out the core game with new, persistent elements. The next update dropping next month, Forsaken Shores, will add a rowboat and a new area to the map, which hopefully won't disappear once the complementary campaign runs its course. In Rare's defense, it didn't promise any specific features it didn't include in the final game. More, it sold the idea of a multiplayer sandbox full of fun. The problem is, it's not full of anything, yet. It is possible that Sea of Thieves could eventually become the game everyone hoped it would be from the beginning. Hello Games has shown that a commitment to continued development can make up for early shortcomings. Take that open world and build something beautiful on it. But it might be a few years before Sea of Thieves has its 'NEXT moment.' Or perhaps, it never will.